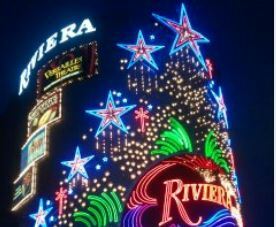 Riviera Hotel and Casino used to be a top 3 resort in Las Vegas before the mega resorts were the new thing. at 4000 rooms it was the largest in its day and the location was the most happening all over Vegas. But now the shift is to the center strip so the north end of the strip, where Riviera is located is dead. What does that mean to You? It means You can get a great room deal on a great room. Keep Your options open, bus service runs in front of this hotel and is very cheap to get up and down the strip. Or a short walk will get You to the Las Vegas monorail that will take You all the way to the south end of the Las Vegas strip in a few minutes.